For more specifications, schematic, etc. Discover Arduino through fun and easy lessons. This starter kit comes with OSEPP Uno R3 plus board which is the basic starter board. It serves as a great starting point to the wonderful world of Arduino. 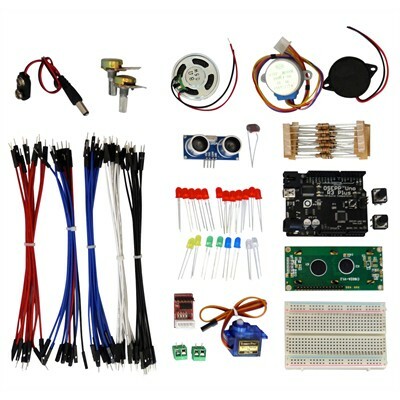 Kit comes with step-by-step instructions with diagrams and whole bunch of parts to build 15 projects across 8 categories; Temperature, Light, LEDs, Sound, Ultrasonic, Servo Motors, Stepper Motors and LCD. Built on the 'open-source electronics prototyping platform', and compatible with existing Arduino software lilbraries.